Setting up new classes of shares in an existing company. The shares can be different classes of ordinary shares (A shares, B shares, etc), non-voting shares, redeemable shares, or any other class of shares. Most companies have just one class of shares, which will be ordinary shares carrying one vote per share, full dividend rights and full rights on a winding up. Often companies set up different classes of shares for a range of different reasons. These may include wishing to pay dividends in particular ways, providing shares for family members or employees, to separate the voting rights, capital rights and rights to profits by allocating the different classes, or for many other reasons. See further classes of shares. The first stage to this will be to describe the different share classes and the rights attached to them in the company's articles. This is a question of drafting the articles to include the right provisions and adopting the new articles as the articles of association of the company. Some of the new shares may then have to be issued to whoever is to receive them. In some cases, existing shares are converted into shares of the new class. Any of these changes must be approved by the directors and separately by the shareholders by the right type of resolution. Such resolutions can be passed as written resolutions under the new procedures in the Companies Act 2006 (our preferred procedure) or at an Annual or Extraordinary General Meeting. All the procedures and forms were amended by the Companies Act 2006 (most of which came into effect on 1st. October 2010) and it is important that the correct procedures are followed and documents and forms produced. We can do all the work involved, or only parts of it, as you require. Most people who take this service ask us to draft the new articles and also to provide the resolutions and forms for them to be adopted by the company. In many cases they also ask us to provide all the necessary resolutions and forms for an allotment of the shares to the people who are to get them. If existing shares are to be converted into the new classes, they will usually ask us to do that as well. When stages are combined in this way, we naturally produce one set of resolutions that deal with all the matters at once. So, for example, if the company has to pass a resolution to adopt new articles and also has to pass one or more resolutions to allot the shares, these different things will all be done as part of one process. We will not send you different sets of paperwork for the separate stages. Our Prices page shows the cost of the individual services separately and also the cost of combining two or more of them together as one service. share certificates and/or completed registers (if required as an additional service). If the company is a single person company, with just one director/shareholder, appropriate alternative documentation is provided. The service described on this page will be provided at our standard benchmark price, except in very exceptional cases, but please note the comments above about combining services. Note, too, that this service is often provided in addition to other services, such as reviewing, drafting or updating the articles. All costs are kept on one web page to make updating for VAT changes, etc. simple. what rights the shares have on winding up or redemption (this is usually whether the shares get only their nominal value back (e.g. 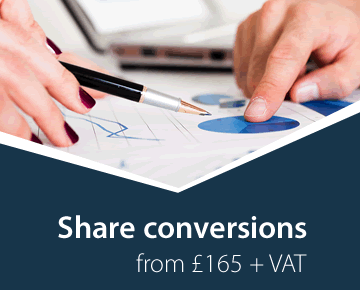 £1 on a £1 share) or share in the full value of the company.